If you’re a well-heeled sci-fi fan, you probably know about the rarely-seen rough draft of Star Wars. It’s crazy different, with characters that have similar roles but different names, among other things. Today, Dark Horse Comics’ adaptation of that early pass hits store shelves. Myself and Mike Fahey have read through the miniseries’ first issue and spilled our thoughts all inside a chat window. Did you know that Luke Skywalker is all old in this? Spoiler Warning: This conversation features images and plot details from the first issue of The Star Wars. Mike: Well. That was... odd. Evan: Yes. Yes, it was. The main takeaway for me is that it really, really feels like a first draft. Mike: Really? Because for me it feels like the prequels. So yeah, same thing I guess. Evan: Like the scribblings from the margins of George Lucas' high school algebra notebook. All the trade stuff... gah. Mike: "Star... Starshooter. No. Star... dancer! No, that's a pony name. STARKILLER. YES." Evan: Hahahaha. And just like the prequels showed, arguments about shipping lanes are not a great mover of the excitement needle. Mike: I had to resist the urge to fall asleep in mid-comic during the trade bits. Force of habit. Here's a young boy that looks like Luke Skywalker. You like Luke Skywalker, yes? He's the embodiment of your childhood fantasies? WELL NOW HE IS DEAD. Let's talk about trade routes. Evan: And even worse is how that scene was oddly underplayed. Mike: He's flung aside like a piece of trash, the new (I guess) hero of the series angry that anyone is upset by it. Evan: Y'know, a few summers ago, I went on vacation with a bunch of friends. One of them had never seen Star Wars before. Mike: That friend was George Lucas. Evan: Hahahahaa! But, seriously, Watching her react to it, I was struck by how there's so much to laugh at, get choked up by and get scared of in Episode IV. That emotional spectrum is missing here. 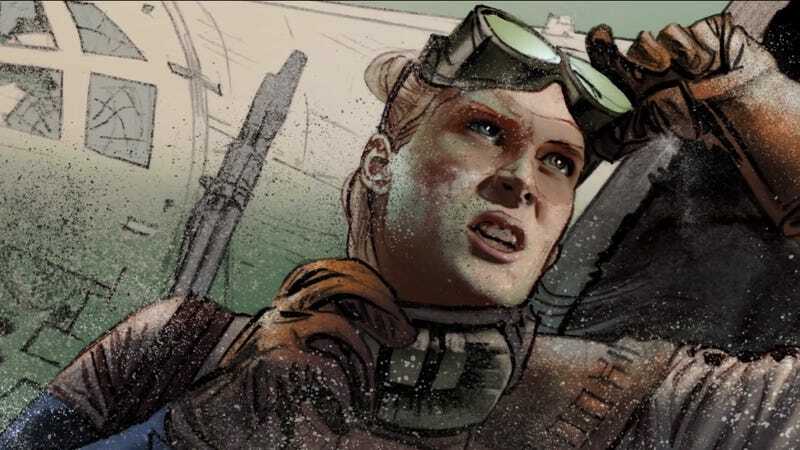 If that film version of Star Wars is influenced by old film serials, then this comic betrays the influence of, say, Tolkien or something drier. Mike: Or maybe Conan. With the heroes (again, I guess) certainly. There's no establishing shot. There's no real "Here's Luke at home, having a normal life. Luke could be you." Evan: True. All of the main characters are all busy in activities that we can't relate to, like looking just like George Lucas in weird headgear. Mike: What, you don't negotiate trade routes or teach your children to solve floating cube problems? What kind of father are you? Evan: Not a Jedi-Bendu, that's for sure. Mike: You're like Darth Vader, all tall and unmasked and looking like Alex Ross evil Superman. Evan: Stuff like that is so weird! Mike: But I have to say, I do think the emotional stuff is certainly conveyed in Mike Mayhew's art. He's not related to Chewbacca Mayhew, is he? I've never read any of George Lucas' first draft, so I don't know how this plays out. But you know how Starkiller reveals he's just a head and arms? I am hoping Darth is the rest of his body. Evan: Hahaha! You're homing in on the main draw here, which is this is a bit of Star Wars apocrypha. Mike: It's certainly interesting to see what might have been. A lot of this stuff would not have worked as a movie in the 1970s. Just as it didn't work for movies in the late 1990's / early 2000's. Evan: This fictional universe feels like it can't be bothered for you to catch up. Mike: It's missing the pre-credits scroll. That's an important Star Wars thing. *goes back to beginning* Oh wait no, there it is. Well, it does catch you up. There's a pre-credits scroll and everything. The Imperial Space Force is dying, the Knights of Sith are coming, and there is mention of the celestial equator. Kids love the celestial equator. I am making my children Celestial Equator t-shirts. Evan: "Did you fight in the Embargo Battles, father?" Mike: "I was there when the first trade routes were ratified. The smell of ink was thick and heady." Evan: Reading this just drives home how lean the original trilogy was. Mike: The original trilogy was a series of set-pieces and mini-adventures strung together. It was fun. It had energy. Evan: And, to me, the original trilogy found its momentum more from the character's motivations than from the political macguffin side stuff. Mike: There was hardly any of that in the original trilogy, really. It was mostl military manueverings. It feels like Lucas wanted the politics in the original, reading this, and it explains why there's so much of it in the prequels. Mike: And, like the prequels, the visuals here are amazing, but they don't save the content. Evan: Yeah, I have to agree. It's like looking through a recovered sketchbook. The only reason for continuing to pick up the series is to see how different things would have been in this version. And that's not much of a reason. Mike: Right. This an adaptation of a first draft, and it was a first draft for a good reason. You know what would really make this issue work? Mike: Jar-Jar. Tons and tons of Jar-Jar. Mike: Christ would have been good too, yeah. Evan: Ok, let’s just end on that note. Thanks, Mike. Mike: Live long and prosper, Evan. Evan: Wrong Star... Never mind.